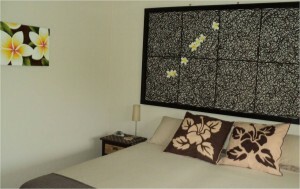 Come and experience “Island Time” in Rarotonga. A place where you have time to talk, be lazy, or do absolutely nothing without feeling guilty!! Relax by the pool or under the gazebo in tropical gardens. Enjoy magical sunsets. Snorkel or paddle a kayak on nearby Muri Lagoon. Island Time Villas offers you great holiday accommodation – no confined spaces here, just freedom and privacy – ideal for that “get away from it all” holiday. And, we’re the perfect option for two families holidaying together, extended family groups or groups of friends – there’s plenty of space for everyone. With an on-site pool and childrens playground, kids are well catered for at Island Time. Located at the southern end of Muri, it’s just a leisurely stroll to some of the Island’s great restaurants, cafes, convenience stores and car rentals plus the beach is a mere 75m away. Escape to a place where the clocks are running on “Island Time”. Don’t wait … book today! !